Today we’re going to take a close look at one painting, Teresa Elliott’s disconcerting Brink. And above all, that upsetting figure. Her brow is furrowed, her eyes are just starting to tear, her pupils are dilated, her nostrils flare. She appears to be sweating, her cheeks are flushed, and her mouth hangs open. Her hands leap protectively to her neck. Each of us carries a thick encyclopedia of human expressions we can recognize. This one is very obscure but very specific. It is the particular fright linked to the question What almost happened to me just now? 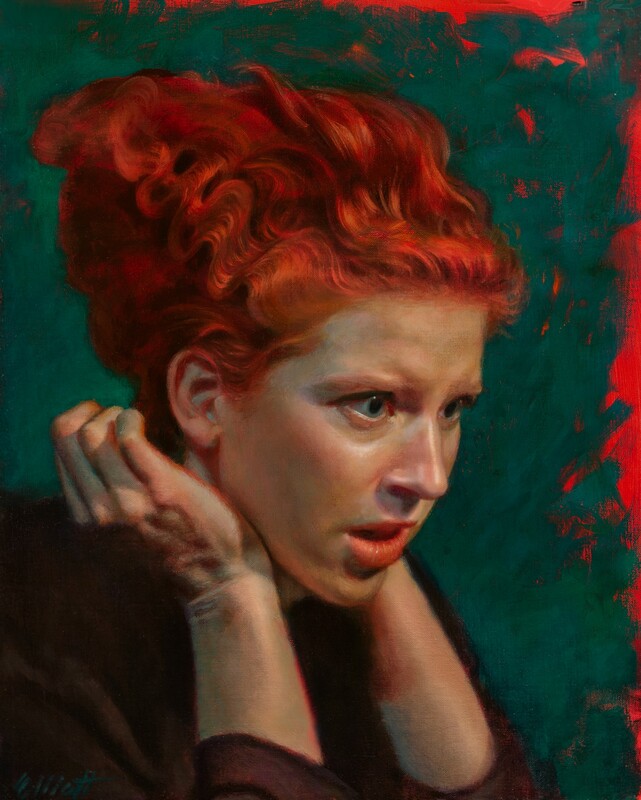 Her tall red hair reinforces the expression, both physiologically and formally: hair puffs out under such circumstances, rising in volume, as it does here to an expressionistic, Bride of Frankenstein extreme. The disheveled waves repeat the dominant diagonal while they angrily scramble it. And the flaming color is the visual equivalent of a shriek. This is a striking depiction, absent any further context. It is, point blank, a masterpiece of emotion, harnessing every formal element to its meaning while closely observing every nuance of physical expression of the figure’s inward state. There is a narrative implication that she is looking at something to the right which we cannot see, but her expression suggests more strongly that she is, at the moment, blind. She has realized something, and flares in horror as she asks — What almost happened to me just now? There is context to this. The context does not necessarily enrich our understanding of the painting, but it goes a long way to revealing the nearly oracle-like property of art and art-making. The painter, Teresa Elliott, was working with an acting troupe, and became fascinated with the extremity of expression they were able to invoke. She shot a series of reference photographs, and this painting began on the basis of those. While she was painting the painting, she had the recent Netflix series about serial killer Ted Bundy playing in the background. Painters often do this. Because painting so strongly engages the visual side of the brain, while leaving the verbal side unoccupied, the verbal side may become restless. So we listen to verbal things — radio shows, books, podcasts. There is a time and a place for listening to music or nothing. Breakthroughs in the work demand total-brain engagement. But this degree of absorption is exhausting, and for the representational painter, it is often unnecessary: the structure of our inspiration and our work is such that inspiration comes in short periods between longer periods of completing what we began. During these completion stages, the verbal mind wanders, and listening to recordings helps to keep it anchored during the many hours the visual work demands. So Elliott was listening to this Ted Bundy series. And it slowly dawned on her that one of the victims described in the show, abducted while hitchhiking in Idaho in 1974, was taken a few miles from the stretch of road where Elliott, then a young redhead of Bundy’s target demographic, was also hitchhiking. Abruptly, the story of the character in Elliott’s painting was revealed as Elliott’s own story. That instant of recognition — What almost happened to me just now? — was delayed by 45 years, only to come thundering home at last. It was as shriekingly horrific as a new trauma, but fermented over a lifetime until the shock became uncanny — uncanniness being, as Freud usefully has it, “the return of the repressed.” In her youth, Elliott brushed past her own horrendous murder. The true nature of the painting animated the remainder of the act of painting it, an act which Elliott describes as something she wished would never end. All painters know this zone, in which the work enters a strange territory of rightness, and virtually paints itself. There is one last way this painting transcends its story: not only the weirdly particular Ted Bundy story, but the general psychological story we were constructing for it at the beginning. It is in the gesture the figure is making, that seemingly arbitrary protective gesture of the wrists around the neck. Through this gesture, the painting sets in tragic counterpoint two fundamental elements. On the one hand, there is the radically active face, so full of expression, eyes so wide and aware. There can be no more complete depiction of the presence of human life, of soul. And on the other hand, there is the terrible vulnerability of the neck, by which we mean, the vulnerability of matter — that the seat of the soul is made of stuff, and that stuff can be broken, until it will not hold the soul anymore. Under threat of dissociation, the animating soul instinctively defends the weak juncture of mind and matter, head and body — the hands rise to the neck. Our flaw, that, being made of meat, we only recognize ourselves as meat, and yet the meat is frail, and must give way, is not only the horror of murder, but the tragedy of our mortal existence. This riveting and upsetting painting depicts an escape from the brink, from present catastrophe, but it locates the catastrophe not only in the present, but in the remote past and ultimately, in the future as well. Those diagonals go on sliding down and to the right, and in the end we all will follow where they go. Artist and author. The other one is also me. I goofed up creating a profile.